To mark the start of the National Trust’s seasonal celebrations, Britain’s most spectacular collection of 1,000 ‘Christmas trees’, whether real, decorated or crafted, has gone on display from today at Wallington, a stunning 17th century home and grounds in Northumberland. Behind the scenes, the 1,000 trees have been dressed by a team of 33 volunteers and staff, who have spent an incredible 744 collective hours preparing the festive decorations. The transformation is such a big feat that the team begin their Christmas plans in January – a full 330 days before launch. The spectacular centrepiece at Wallington is the 115-year-old 45ft Nootka tree, which sits in front of the main house. It takes a team of specialists two days on cherry pickers to hang 6,000 LED bulbs that transform the tree– with a further 6,000 lights adorning the trees across the rest of the estate. This year is a celebration of the old and new traditions of the 13,000-acre estate, which has been preserved and protected by the National Trust since it was donated by the Trevelyan family in 1942. The 1,000 trees of Christmas were inspired by the Trevelyan family’s unique ‘Book of Trees’ which was kept by three generations - capturing the life cycle of trees around the property. To mark one of the oldest traditions, the family’s original 130-year-old wooden Christmas sleigh will sit proudly outside the property for visitors to create their own magical festive memories. Robert Thompson, the House Steward for Wallington said: “We are so proud of our property team as hundreds of hours of hard work and commitment from our staff and volunteers go into to making sure we are ready for Christmas and all the festive fun that comes with it! This is just one of many Christmas celebrations taking place this year at National Trust places in the North East. At Gibside you can browse the festive markets on Saturday 17 December, where you can pick up last-minute gifts from local craftmakers. The ever-popular Beer and a Bite night, with offerings from the Fat Hippo and Earth & Fire pizza, will be running from 6-9pm on 17 December. 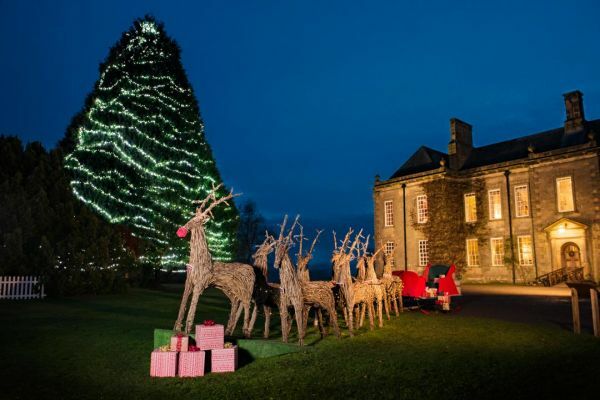 Gibside also plays host to a 5km Santa Dash around the 18th-century estate on 11 December. At Seaton Delaval Hall enjoy festive music every weekend in the West Wing Old Kitchen. Local choirs, swing and jazz bands will be playing live from 12-2pm.